Researchers in China have developed a battery with organic compound electrodes that can function at -70 degrees Celsius—far colder than the temperature at which lithium-ion batteries lose most of their ability to conduct and store energy. The findings, published February 28 in the journal Joule, could aid engineers in developing technology suited to withstand the coldest reaches of outer space or the most frigid regions on Earth. While batteries can operate in relatively cold climates, they have their limits. Most perform at only 50% of their optimal level when the temperature hits -20 degrees Celsius, and by -40 degrees Celsius, lithium-ion batteries only have about 12% of their room temperature capacity. This can be severely limiting when it comes to operating batteries in space, where temperatures can dip to -157 degrees Celsius, or even in parts of Canada and Russia, where temperatures can be lower than -50 degrees Celsius. But a team of battery researchers have found a design that can function even where other batteries might fail. "It is well known that both the electrolyte (the chemical medium that carries ions between electrodes) and electrodes (the positively charged cathode and negatively charged anode) have great influence on the battery performance," says Dr. Yong-yao Xia, a battery researcher at the Department of Chemistry of Fudan University in Shanghai, China. When it gets cold, the ester-based conventional electrolytes that lithium-ion batteries often use become sluggish conductors and the electrochemical reactions that occur at the interface of the electrolyte and the electrode struggle to continue—meaning that lithium-ion batteries don't hold up too well in ultra-chilly climates. It's a problem that has consistently vexed researchers. The team experimented with using an ester (ethyl acetate)-based electrolyte, which has a low freezing point that enables it to conduct a charge even at extremely low temperatures. For the electrodes, they used two organic compounds—a polytriphenylamine (PTPAn) cathode and 1,4,5,8-naphthalenetetracarboxylic dianhydride (NTCDA)-derived polyimide (PNTCDA) anode. Unlike the electrodes used in lithium-ion batteries, these organic compounds don't rely on intercalation—the process of continuously integrating ions into their molecular matrix, which slows down as the temperature drops. "Benefitting from the ethyl acetate-based electrolyte and organic polymers electrodes, the rechargeable battery can work well at the ultra-low temperature of -70 degrees Celsius," Xia says. Xia and his team believe this may be a more elegant solution than alternative attempts to boost lithium-ion battery function in extreme temperatures. 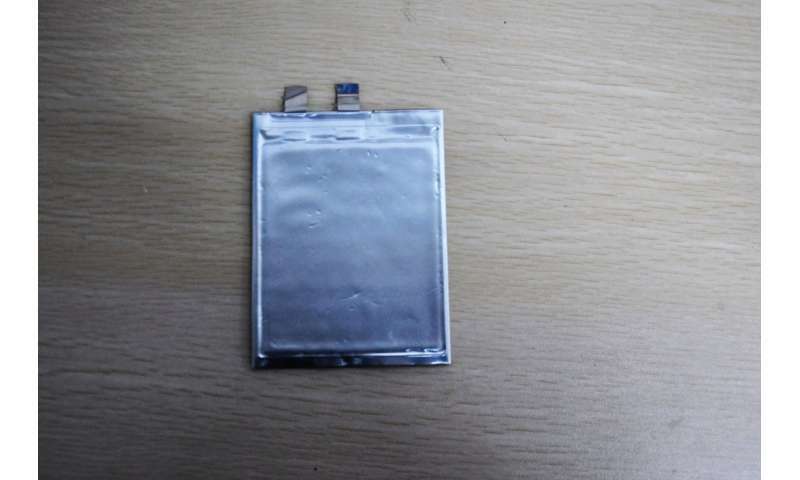 Other battery researchers have tried to remedy the issue by developing additives to externally heat the batteries or by using a liquefied gas electrolyte, but these solutions require additional materials that add extra weight. Xia thinks the composition of the battery has plenty of other production-friendly qualities, too. "Compared to the transition-metal-containing electrodes materials in conventional lithium-ion batteries, organic materials are abundant, inexpensive, and environmentally friendly," he says. He estimates the price of the electrode materials at about one third of the price of electrodes in a lithium-ion battery. However, the battery will still require some tweaking before it is ready to leave the lab. Xia believes the specific energy (the energy per unit mass) of the battery is still low compared with commercialized lithium-ion batteries, and the assembly process needs to be further optimized. "But even though it has low specific energy, it provides the most promising potential in special field applications," Xia says. Interesting. I wonder how much heat can it handle?? While most lithium batteries don't lose very much capacity with falling temperatures, what they do lose is the ability to recharge. The recharging window for the common types of lithium batteries used in EVs and cellphones have a charging window between 0 - 40 C and that's a serious limitation. For example, if you start up an EV cold in the morning and you forgot to recharge it overnight, it won't accept a quick charge without first warming up the battery above 0 C, and with half a ton of batteries on board that may take a while. It means in colder climates, people have to keep their cars in garages, or keep heaters on the batteries almost all through the winter, wasting tons of energy. The comments by Eikka show us why advances come from elsewhere. His attitude would be laughed out of Silicon Valley. Whereas they see barriers as barriers, we see them as challenges. "His attitude would be laughed out of Silicon Valley." What attitude? Describing how other lithium batteries behave? Any engineer in Silicon Valley would be happy to know what they're working with, so they don't spend millions only to find that what they have to work with is inadequate for the task. Real engineers - as opposed to hype mongering salesmen - don't read a part datasheet without taking a look at the errata page to find what problems they might encounter. Knowing what problems might exist in advance is even better, because it saves you time and you know what questions and demands you're going to make - and what definitely won't work. That way you end up with less product callbacks and warranty service costs, or PR disasters like "you're holding it wrong" in response to a faulty antenna design in a cellphone. Expectations, meet reality. Seeing barriers as mere "challenges" is foolhardiness. The engineer can't squeeze blood from a stone. For example, I was working with a particular microchip which is programmed by sending a signal to its reset pin. The design was running out of pins to use, but it was known that the reset pin could be re-purposed for other tasks by using a different method of programming common for these chips. A challenge - and a workaround. However, for that particular part, the errata said the other programming method doesn't actually work - it was not implemented properly and could not be used, and the attempt would render the part un-programmable. A new challenge, and a new workaround: program the chip to be programmable in a custom way. Or, as the problem was found out sufficiently early in development, a different chip was substituted and the effort and cost to work around the problems spared. A brave man climbs over a mountain, seeing it as a challenge to surmount - a wise man goes around, remembering that the point is not climbing mountains but getting to the other side.